The Mahdist army was essentially a collection of regional armies. With the capture first of El Obeid in 1883, and then of Khartoum in 1885, a central administration was established and the various regional armies were officered, organized, reinforced and coordinated by the central government. In the early years (1883-5) Mahdist com­manders in various parts of the country had to count mainly on the warriors they could raise locally. After Hicks’ defeat at Shaykan in 1883 the Mahdi was able to send reinforcements to other areas, but it was not until after the fall of Khartoum that the regional armies could be fully coordinated. Until then the bulk of the Mahdist army was to be found where the Mahdi was, whether that was in Kordofan or surrounding Khartoum. But even at the height of the Madhiyya at the end of the 1880s, when the Mahdists could field an army of 80,000 men, the distances involved and difficulty of communications meant that the territorial nature of most of the Mahdist armies was never fully overcome. Thus the armies could not be regarded as uniform, frequently arming themselves and recruiting locally as best they could. There are almost no reliable contemporary figures for the size of various Mahdist forces in the early battles. It is only in the Eastern Sudan, under Osman Digna, that the Mahdists seemed to have kept any record of the number of troops involved. Some of the figures given here are estimates arrived at well after the event. The Mahdi’s entire army in Kordofan after the fall of El Obeid probably numbered 40-50,000 men. The Ansar had captured nearly 14,000 rifles (mainly Remington single-shot breach-loaders), and five cannons (small brass mountain guns). There were only 5-7000 trained riflemen in the entire army (almost all Sudanese who were formerly in the Egyptian army), and none of the cannons were used by the Ansar until the siege of Khartoum. There were also only about 3-4000 horsemen in the army; the rest were sword and spearmen. Hicks’ force was harassed by a flying column of 3000 men, mostly horsemen. Another 1000 horsemen remained with the Mahdi’s main army. These were used to help transport 5000 riflemen to the forest of Shaykan when Hicks’ force was finally trapped. The riflemen ringed Hicks’ square with continuous sniper fire. The final assault was launched by about 30,000 footmen armed with sword and spear. A. Sudanese warrior, Abu Klea. B. Sleeveless and short-sleeved jibbas, Abu Klea: collar decoration red, lozenge patch on chest red or green, waist decorations red or black, hem sometimes trimmed in red. C. Beja warrior, 1884: cotton robe, colors: white, gray, tan, terra-cotta. D. Early jibba, Eastern Sudan, 1885: lozenges and squares red and dark blue, borders (neck, sleeves, hem) red. Embroidered taggia (skull cap); design in red and dark blue. F. Rizaygat baggara horseman, 1883. The British force at Abu Klea was less than 1500 men, and at Abu Kru less than 1000 men. We have no reliable figures for the Mahdist forces at either battle. At Abu Klea there were local recruits, reinforcements from Kordofan and the main army camped outside Khartoum, as well as some former Egyptian army riflemen and a small contingent of horsemen. The horsemen acted as scouts and kept out of the main assault, though there were mounted amirs leading their men and one compact band of about 25 horsemen in the final charge. The infantry were divided into three main groups: the riflemen who kept up a continuous skirmishing fire from behind the sand dunes before the assault (standard Ansar tactics), a main assault force of sword and spearmen from Kordofan and the Gezira (the land between the Blue and White Niles), and a reserve of local warriors. Neither the bulk of the riflemen nor any of the reserve were involved in the final charge. One estimate of the total force, given by a Mahdist prisoner (who had once been an Egyptian soldier) was 9-11,000 men. Estimates of the final assault force vary from 1500 to 5000. As it lost at least 1000 men killed, it most likely numbered 5000, so about half the Ansar force was involved in the main battle. The Intelligence Dept. finally estimated that the Mahdist force was composed of: 2060 men from Berber, 2000 from Metemma, 1000 from Khartoum, and 4-6000 from Kordofan. This force contained only some 460 ex-Egyptian army riflemen. The Uthman Diqna’s earliest battles with the Egyptian army along the Red Sea coast, he sometimes won even when outnumbered by his enemy. Figures for only the main battles are given here. El Teb (4 February 1884): 1200 footmen, armed with swords and spears (defeated a force of 3700 men). 2nd El Teb (29 February 1884): 6000 men. Also had 4 Krupp field guns, 1 brass gun, 1 Gatling gun and two rocket tubes captured from Baker, but only two Krupps seem to have been used in the battle. There were also some riflemen using captured Remingtons, but their numbers were extremely small, they were used only in the first skirmish of the battle, and being untrained they were not as effective as at Abu Klea and Abu Kru. Some 2500-3000 footmen were involved in the main assault. The Ansar lost about 1500 men. Tamai (13 March 1884): Uthman Diqna may have had a total of 12,000 men in the hills around Tamai, though not all were committed to the battle. There were about only 150 riflemen (again very ineffective because untrained). Total Ansar casualties were 1500-2000. Hashin (20 March 1885): Only about 3000 footmen facing a force of 10,000 British. About 250 killed. Tofrek (22 March 1885): No less than 2000 footmen, all armed with spears and swords, maybe more. Lost about 1000 men. In all of these battles the Beja were organized according to their tribal sections (Hadendowa, Bisharin, etc. ), fighting under their own leaders. Early in the Mahdiyya the Mahdi proclaimed the dress of the Ansar to be a patched jibba (a loose cotton shirt, hanging down to about the knees, with sleeves coming just below the elbows), close fitting cotton drawers, a skull cap, a turban (imma) with a tail (aziba) hanging free behind the left ear. The jibba was to be found mostly among the troops in the main army, but it was infrequently worn in battles against the British in 1884-5. This is because so many warriors were regional levies, and few came from the more organized army of the Mahdi. At Abu Klea and Abu Kru most of the Ansar wore a white cotton robe wrapped around the waist, with one end tied over the left shoulder, shaved heads and a white cotton skull cap. The riflemen in the force (most of whom came from the Mahdi’s camp at Omdurman) wore jibbas. There were a few warriors in the main assault force who were also wearing jibbas. Some observers claim these were the men of higher rank. They could also have been among those who came from the Mahdi’s main camp. The jibba worn at Abu Klea does not seem to have been like the later jibba. They had very short sleeves or no sleeves at all. There were very few patches, mostly diamond or lozenge shape, not the rectangles and squares common on later jibbas. In the Eastern Sudan the Beja wore their normal costume throughout 1884 and during most of the battles of 1885. This was a cotton waist cloth, or cotton trousers, or a cotton robe as described for Abu Klea above. As the cloth was exposed to extreme wear it was rarely white, but more often stained by dust and grime to drab shades of gray, tan or terracotta. A few Beja sewed a patch of red or blue on to their clothes to show their adherence to the Mahdi, but most did not. The Beja throughout these battles normally did not shave their heads (as prescribed by the Mahdi), but wore their hair long and in elaborate hairstyles. Contrary to what some figure makers have listed in their catalogues, there do not seem to have been any distinct tribal hairstyles or manner of dress to distinguish the different Beja sections. The Beja seem to be the only Mahdists in this period who carried shields into battle. They were not used at Abu Klea or Abu Kru. A few individuals in 1884, and several more in 1885, shaved their heads and donned patterned skull caps and jibbas. The patches on both the skull caps and jibbas were mostly red and dark blue, but again, they were not the same shape or style of decoration as later became familiar. By the time of the Battle of Ginnis (30 December 1885) the more familiar standard style of jibba began to appear, but one sketch of the battle still shows some Ansar in the sleeveless jibba. I have yet to see an example of this sleeveless jibba in any museum, however. Very early the Mahdi had divided his forces into “flags” rayya, under his three Khalifas, but these divisions at first represented regional organization. The Black Flag, al-rayya al-zarqa, under the Khalifa Abdallah was drawn from the West, containing Baggara from Kordofan and Dar Fur, and most of the black riflemen. The Red Flag, al-rayya al-hamra, of the Khalifa Muhammad al-Sharif was drawn from the riverain peoples north of Khartoum. The Green Flag, al-rayya al-khadra, of the Khalifa Ali and Hilu recruited Arabs from the Gezira region between the Blue and White Niles south of Khartoum. With the death of the Mahdi and the decline of his family under the Khalifa Abdallah, the Red Flag also declined in importance. The Black Flag became the most powerful division in the central army, acting essentially as the main recruiting center for the army since it was commanded by the Khalifa’s brother, Yaqub, who was commander-in-chief for the army. Outside of Omdurman there were regional garrisons. These contained both long-serving regulars living in bar­racks (both African riflemen and spear carrying Arabs), and volunteers or recruits from the surrounding areas. Large scale expeditions were also drawn from regulars and recruits. Under the Mahdi each of the “flags”, as well as the regional garrisons were organized into rubُs (“quarters”), roughly battalions of irregular size. As it evolved, the rubُ, by the 1890s, could range anywhere from 800 to several thousand, though the average size was 800-1200. Each rubُ had an administrative unit and three combat units: spearmen divided into standards of tribes and sections of tribes; the jihadiyya (regular riflemen) organized into standards of 100 men under an amir; with each standard subdivided into 4 muqaddamiyya of 25 men each under a muqaddam; and the cavalry, usually Baggara, armed with long spears and swords, except on reconnaissance when they were occa­sionally armed with rifles. Regulars included riflemen and artillerists, most of whom were Africans who had formerly served in the Egyptian army. The cannons in the regions were usually 18th century brass mountain guns mounted on small carriages which could be dragged by one camel. In the arsenal at Omdurman were Krupp field guns and various multi-barreled, crank-operated machine-guns. Omdurman: 15,000 riflemen, 3500 cavalry, 45,000 sword & spearmen, 46 guns (including 6 large calibre Krupp guns and 8 machine-guns). Southern Sudan: 1800 riflemen, 4500 sword and spearmen, 3 guns. Western Sudan: 6000 riflemen, 350 cavalry, 2500 sword and spearmen, 4 guns. Dongola & Egyptian Frontier: 4650 riflemen, 1200 cavalry, 8000 sword and spearmen, 18 guns. Eastern Sudan: 6900 riflemen, 2150 cavalry, 4100 sword and spearmen, 4 guns. Cavalry were rarely massed together in battle and were used mainly for desert reconnaissance and raiding. The artillery was rarely used offensively but was kept in forts and placed on steamers. There were five steamers in use by the Mahdists in 1898. The following is the organization of the Mahdist forces on the frontier in 1896, and the force that fought at Omdurman in 1898. The total force in the northern-most frontier district facing the Anglo-Egyptian army after the battle of Firka probably numbered: 1700 riflemen armed with Remington rifles (900 trained African jihadiyya, 800 Arab jihadiyya), about 2800 sword and spearmen, 650 horsemen, 460 camelmen, 6-8 mountain guns, 1 Nordenfelt machine-gun, and one steamer. Bodyguard: The Mulazamiyya under the direct command of Muhammad Wad Bishara, the commander of Dongola. They were armed with Remingtons and were mostly Arabs, with some black Africans. They were divided into five companies, each under an amir with his own flag. Wad Bishara’s personal following were armed with 10 Martini-Henry rifles and 50 Khashkan elephant guns (fired from a tripod). Riflemen: The Jihadiyya, divided into three rubُs, each under an amir with his own flag, and each further subdivided into groups under a raُs miُa (head of a hundred, or centurion). Two of the rubُs had three raُs miُas each, and one had two raُs miُas. This does not mean that the total force numbered 800 riflemen, as it appears that the commands of each raُs miُa were considerably understrength. Artillery: The Tobgia, 6-8 brass mountain guns and 1 Nordenfelt machine-gun, all manned by “old bashibazuks and Sudanese soldiers”. One mountain gun was sometimes placed on the small steamer, “El Tahera”. Sword & Spearmen: These were organized into four separate rubُs. There were 2 Baggara rubُs, 1 Jaُaliyin rubُ and 1 Danaqla rubُ. 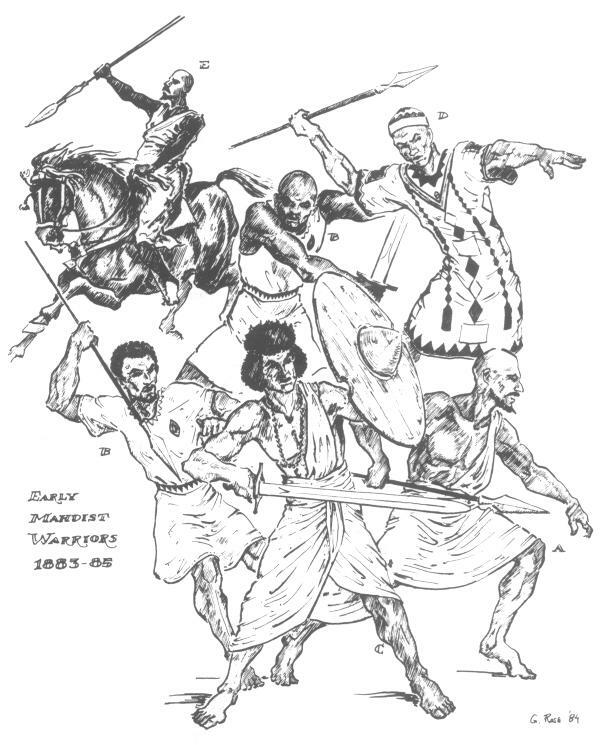 In practice the Baggara outnumbered the Jaُaliyin and the Danaqla (who were natives of Dongola province) and a number of Baggara were assigned to the two other rubُs to bring them up to strength. The first Baggara rubُ was commanded by a Taaish who had 23 amirs under him, each with their own flag and horse. The second Baggara rubُ had 16 such amirs, the Danaqla rubُ 7 and the Jaُaliyin rubُ 19. The largest rubُs (the 2nd & 4th) numbered about 500. Horsemen: The Khayala, was not a permanent body of horsemen. They were all Baggara armed with swords and spears, but carrying no flags. They were usually divided among the rubُs, though occasionally they were brought together under one commander. Camelmen: The Haggana were a collection of local and Baggara Arabs under one amir, but having no flag. They were used for reconnaissance and other desert duties. Abu Hamid: 13 amirs, 457 riflemen (only 200 trained jihadiyya), 1490 sword & spearmen drawn from 9 different tribes (included 300 horsemen), 2 guns. Dongola (camped just outside): 620 jihadiyya with Remingtons, 500 Baggara with Remingtons (probably Wad Bishara’s Mulazamiyya), 280 Haggana with Remingtons, 300 Baggara horsemen, 1250 sword & spearmen, 6 guns. A total of 2950 men. El Haffir: 100 jihadiyya with Remingtons, 150 Baggara with Remingtons, 70 Haggana with Remingtons, 80 Baggara horsemen, 1100 sword & spearmen. A total of 1500 men. Kerma: 150 jihadiyya with Remingtons, 50 Baggara with Remingtons, 50 Haggana with Remingtons, 150 Baggara horsemen, 100 sword & spearmen, 1 Nordenfelt machine-gun. A total of 500 men. Amri Post: 30 Haggana with Remingtons. District Tax gatherers: 15 Baggara with Remingtons, 15 Haggana with Remingtons, 60 sword & spearmen. A total of 90 men. Reinforcements from Debba and Omdurman: 1000 jiha­diyya with Remingtons, 1000 sword & spearmen. A total of 2000 men. There is some dispute over the numbers the Ansar had at the battle, but it is likely that they had not much more than 37,000 men in all. c.1000 men divided into 2 rubُs: 1st rubُ armed with Remingtons, 2nd rubُ divided into three sections - Khashkhashkan, dressed in red waistcoats over their jibbas and armed with percussion elephant guns mounted on tripods; Mushammaratiya, tall men armed with long spears; Bultagia, armed with axes. There was also a band of drums, bugles, and African instruments including the ummbaya (horn made from a single elephant tusk). Mulazamiyya (Uthman Shaykh al-Din): c. 10,000 men, most of whom were armed with Remingtons. They were usually divided into 18 rubُs each divided into 8-10 standards of 100 men each. At Omdurman they were commanded by 6 main amirs, in addition to one commanding Shaykh al-Din’s personal guard of 2000 men. Omdurman garrison (Kara) (Ibrahim Khalil): c. 2400, about half of whom were armed with rifles. This unit was usually divided into 500 standards distributed between 4 rubُs. At the battle they were divided into 3 main rubُs and 3 lesser ones. Uthman Azraq: c. 8000 men under six main amirs. Green Flag (Abdallah abu Siwar): c. 2400 men. This unit was normally divided into 3 tribal rubُs. At the battle it was commanded by five main amirs and had one section of Dighaym horsemen. Black Flag (Yaqub): c. 12,000 men divided into 51 units ranging from 25 to 1500 men each. There were only about 1000 firearms of all kinds with the Black Flag during the battle, including elephant guns, revolvers and rejects. Uthman Diqna: c. 7000 men. Scouts (Abd al-Baqi abd al-Wakil): c. 300 horsemen armed with rifles. Artillery: Yaqub was in command of 63 guns which included 35 brass mountain guns, 8 Krupps, 7 machine-guns (mainly Nordenfelts but 1 Remington), and 13 guns of various types. Of these 31 guns were placed in mud forts along the river around Omdurman and Khartoum (18 mountain guns, 5 Krupp guns, 1 Nordenfelt and 8 other guns). Two of the Ansar’s three steamers at the battle were armed with one mountain gun each. There were 19 guns on the battlefield itself, or on the road out, including 13 mountain guns, 1 Krupp, and 4 machine-guns (including the Remington). 10 guns (including 2 Krupps) remained in the arsenals. Throughout this period the standard Mahdist uniform of jibba and turban was worn, through in some cases warriors discarded the turban and wore only an undecorated straw skull-cap or went bare-headed. Jibbas were patched mainly with rectangular and square patches in symmetrical designs, having the same pattern on the back as the front. Patches were centered on the front of the jibba, numbering two or three. There was usually one large patch on each arm and one patch on each side of the skirt of the jibba. There were sometimes small rectangles under each arm. Collars frequently were bordered by a triangular patch. Cuffs, hems and the edges of collars were often trimmed in red, blue, black or yellow. The main colours used for patches were: black, dark blue, medium blue, turquoise, red (various shades), and green. Black patches were frequently edged in yellow, blue patches were sometimes edged in red. Amirs usually had embroidery on their patches, especially on the club-shaped breast pocket. Jibbas were manufactured in Omdurman and frequently issued to troops at the start of a campaign. There are many identical jibbas on display in various museums, but it is not certain whether whole units wore the same type of jibba. Some jibbas from Dongola show a regular use of black, dark blue and red patches on each jibba. A mulazamin jibba on display in shows medium blue patches around the collar and on the front and back, and red patches on the sleeves, under the arms and on the side. The mulazimiyya also wore red turbans and red sashes. Some senior amirs also wore red turbans. Drawings by Greg Rose. Based on photographs supplied by the author. a & b: Dongola jibbas. B may be the jibba of an amir and has gray-blue cuffs and a turquoise center patch. c: Jibba on display in the Khalifa’s House Museum, Omdurman. These were usually written in four lines, but sometimes the phrases ran into each other and were put on three lines. Whatever the formula flags had to have the last line, or a similar line proclaiming the Mahdi’s relationship to the Prophet Muhammad. Most flags were rectangular, about 4 feet by 3 feet. They were manufactured in Omdurman and there are some duplicates on display. When not in use flags of a particular division were stored together in the arsenal. The Khalifa’s flag was black with white letters. For more information on the Ansar armies readers are suggested to read ُ Ismat Hasan Zulfo, Karari (London, Frederick Warne), 1980, and D. Johnson, The Sudan, 1884-98, (special publication of Savage & Soldier Magazine). a. Blue background in the center, white borders and letters. b. White background, red borders, black dividing lines, red, green and black letters. c. White background, black letters, dark green border (repaired with red cloth).